Canal Road in the District parallels the canal and the Potomac, but planners have resisted infringing on the peaceful atmosphere of the river here. At canal mile 3.1, stands the Abner Cloud House, one of the larger structures on the canal. 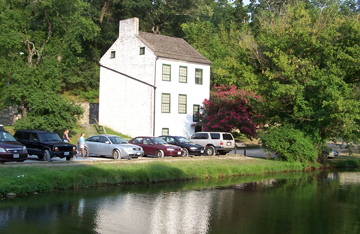 It is the oldest existing building on the canal, built as a home for a miller in 1802. Abner Cloud built the house and nearby mill on the bank of the Little Falls Skirting Canal. The mill provided grain and flour to the city of Washington before and during the operation of the Chesapeake & Ohio Canal. Cloud was related to the Pierces of Rock Creek, who owned the Pierce Mill. Abner Cloud died in 1812, but the mill continued to provide an excellent quality flour called "Evermay" to Washington until it closed in 1870. The Cloud House was restored in the 1970s and is maintained by the Colonial Dames of America. The house is located on the Canal at Canal Road and Reservoir Road N.W., Washington DC, adjacent to Fletcher's Boat House.